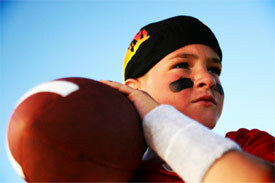 Many parents debate about letting their children participate in physical contact sports. This can take the form of various activities ranging from wrestling, karate, football, and rugby, to the less obvious ones such as soccer, tennis, basketball, baseball, volleyball, fencing and even golf. The list goes on and on. Therefore, instead of responding to each individual sport, I decided to take a more generic approach regarding my overall thoughts on this. The main factors to teach them for any sport activity are safety, discipline, sportsmanship, and how to deal with winning or losing. While many have their own opinions as to why one sport is safer or better than another, my philosophy doesn’t differentiate between them. Of course, some sports are inherently more physical and involve a higher risk of contact than others; however, I find that any activity has the potential to become dangerous. We’ve all seen or heard of freak injuries from every sport, including fishing (if you can actually classify it as a sport). Ideally, you should make sure your children are wearing all of the protective equipment available for a specific sport, even if it may not look “cool” to them. While one sport may not be better or worse than another, there is a right and wrong way of learning, playing, and teaching a sport. Every tool one has can be utilized for good or bad. If you learn self-defense you can use it to protect yourself and/or others or use it to intimidate, bully, or harm other people. The choice is always up to the individual. We can’t attribute blame or negative characteristics to sports, weapons, or any activities as they are not inherently bad. It’s the people behind them that give them those traits. You may believe the choice is up to you. However, all children, and adults for that matter, are very curious by nature and want to push the outer limits of life. If your children really want to engage in a sport, you may be able to stop them for some period of time, but chances are you won’t stop them forever. Children are resourceful and can find ways to be involved without your awareness or permission. The main factors to teach them for any sport activity are safety, discipline, sportsmanship, and how to deal with winning or losing. They will learn how to compromise, deal with frustration, and will acquire good anger-management skills. All of which will carry into and benefit them in their day-to-day life. The point of sports is to make exercise fun and competitive, while testing the limits of your body. Like most things there is a right and wrong way of going about it. You do not need to, and should not, give into your child’s every whim and desire. However, when it comes to playing sports you should make sure that they are trained properly with safety in mind. The bottom line is that most things, including money, education, friends, and religion can be used for good or bad. Look at the background, goals, and intentions of those involved in the sport itself, to help you in your decision-making process, and the answer should be clear.